Last night I attended what was without a doubt one of the greatest concerts of my entire life- Roger Waters performing “Dark Side Of The Moon” in it’s entirety, as well as a handful of other classic Pink Floyd tracks. The show was scheduled to begin at 8 but by 8:30 he had yet to take the stage. The anticipation within the crowd was growing more intense by the minute. By the time the lights did finally dim the excitement in the air was palpable and as if on cue, the appropriate stench of ganja smoke began to overtake the crowd. The smiling, bass wielding Waters and his ten piece band hit the stage to overwhelming applause as they launched into the classic “Wall” track, “In The Flesh”. It was a positively triumphant opening and seeing Waters spit out that ever so sarcastic second verse was a concert experience I shall never forget! From there he donned an acoustic guitar and led the crowd through a mass sing along on another classic “Wall” track, “Mother”. The eerie “Set The Controls For The Heart Of The Sun” followed, with footage from the “Arnold Layne” promo video providing the atmosphere on the gigantic video screen behind the band. Appropriately enough the mammoth video screen showed a bittersweet montage of the late great Syd Barrett during the Syd-inspired “Shine On You Crazy Diamond”. Two more “Wish You Were Here” tracks came after that- an excellent rendition of “Have A Cigar” and a rousing version of the hugely popular title track, during which the crowd’s singing threatened to drown out Waters himself. These first six songs rank amongst the finest opening to any concert I’ve ever witnessed. They were worth the price of admission alone but Waters was just getting warmed up! The crowd’s enthusiasm did wane a bit during “South Hampton Dock”, “The Fletcher Memorial Home” and “Perfect Sense” but a brand new song entitled “Leaving Beirut” came next, and everybody hooted and hollered in appreciation as the blatantly anti-Bush lyrics appeared on the video screen along with some comic strip style illustrations. I’ve read about some booing in other cities but I didn’t detect any boos last night here in Chicago. The first set ended with an absolutely spectacular rendition of the “Animals” track “Sheep”. It was at this point in the concert that the infamous inflatable pig saw the light of day, this time baring scrawled messages including “don’t be led to the slaughter” and “impeach Bush now”. Had the concert ended right then and there I would have went home very satisfied, but the main cours e was yet to come…. After a brief intermission Waters and company reemerged and launched into one of the true bona fide masterpieces of the rock era- “Dark Side Of The Moon”. I must give kudos to Waters’ ten piece backing band which featured not one, not two, but three guitar players- former Clapton sideman Andy Fairweather Low, Snowy White and Dave Kilminster. Kilminster handled the Gilmour vocal parts, and did a great job of it. The band also featured two keyboard players, three female backing vocalists and a sax player. These guys reproduced “Dark Side” absolutely NOTE FOR NOTE, and the quadrophonic sound system was extraordinary, with the samples of clocks, cash registers, spoken asides and laughing madmen seemingly floating through the air around us. Of course, the classic rock radio staple “Money” brought the crowd to it’s knees, but the highlight for me had to have been “Us And Them”, one of my all time, all time favorite songs. I’m not ashamed to say seeing it performed live was so surreal, so positively otherworldly, that it had me weeping like a baby! After “Brain Damage” and a majestic take on “Eclipse” the band left the stage to deafening applause. They quickly reemerged for an encore and launched straight into “The Happiest Days Of Our Lives” and “Another Brick In The Wall”. The crowd didn’t so much as sing along during the “Another Brick In The Wall” refrain. They positively shouted the lyrics and before long I found myself doing the same. “Vera” and “Bring The Boys Back Home” followed and then came the show stopper, an absolutely epic take on “Comfortably Numb”. I became so overwhelmed with emotion I couldn’t help but sing every single word at the top of my lungs. It was a truly transcendent ending to the evening. After Waters reunited with his old bandmates for Live 8 last year, I, like most Floyd fans, was really hoping they’d embark on a reunion tour. Of course, that didn’t end up happening, but this current Waters tour is the next best thing. The contempt for portions of his audience that partially inspired “The Wall” is long gone. He was clearly enjoying himself last night, going from one corner of the stage to the next, all the while manning his bass and smiling warmly at the gathered masses. He could even be glimpsed happily singing along to the parts of the songs where his band members took over the lead vocals. I get the feeling that this tour is in part an effort on Waters’ part to reclaim his portion of the Floyd legacy. He’s even stated publicly that he would be open to a Floyd tour. It’s actually Gilmour who’s said he’s not interested. Perhaps one day they will finally bury the hatchet and embark on one more trek around the world. If not, at least I was able to witness an amazin g concert very much in the classic Floyd mold in terms of scale and spectacle, by the man responsible for so much of their creative output. And that’s a memory I will cherish for the rest of my life…. I must say that I was not to thrilled about seeing this show. Roger’s 1999-2000 “comeback” was very exciting because he was returning to the stage after a 13 year absence and nobody knew what to expect. Just a few years later he is coming back without a new album to support and basically playing most of the same material. His “vocal assistance” has increased (I only noticed it on Every Strangers Eyes in the past), and he is playing Dark Side in its entirety, which I feel is a faux pax. Okay, so he wrote all the lyrics and conceptualized the piece, but from a musical standpoint he only plays bass and does vocals on the last song. I wanted him to do what Gilmour recently did which was to dig a bit deeper into his catalogue and play some different material for a change. All that being said, here’s what I thought of the show. It was pretty good. The giant screen is now LCD crystal clear, like you are looking through a window at times. The visuals throughout the 1st set were excellent, 10 times better than the last tour which were basically a slides projected onto some large bed sheets. The whole show was semi-conceptualized by recreating Pink (from The Wall) in his hotel room listening to an old radio instead of watching the TV like in the movie and LP (don’t know who the actor was that played him). In the Flesh is always a good show opener and lets the audience know right away that this isn’t Pink, its a surrogate band, which automatically forgives Roger for any poetic license he takes with the material. Ian Ritchie’s sax on this song is very forgivable, mostly because you can’t really hear it. Mother was just okay… really took the crowd down a notch. Set the Controls was also just okay, highlighted by another incendiary solo by Snowy White. These 2 tracks could have easily been dropped and replaced by alternate material that he hadn’t played before. Shine On was better this time around, sticking closer to the original, and only performing the 1st half of the song. Have a Cigar was a highlight of the 1st set for me, if only for Kilminster’s perfect copycat version of Gilmour’s guitar work… Roger’s “vocal assistance” (aka lip synching) took it down a few notches (so much for integrity Roger). I really didn’t care for Wish You Were Here… didn’t need the sax part or the girls taking lead vocals during the chorus. Didn’t work. The Final Cut material definitely slowed things down again and The Fletcher Memorial Home, while a good track on the album, was totally embarrassing to me because of the (poor) lip synching job that he did. It was especially noticeable during the middle section when he was reading off the names of tyrants and kings… his vocals sounded so much different here, obviously different than the playback used. Leaving Beirut, the only new track, had some fine solos, and excellent graphics, but the song is pretty weak in general. A bland and repetitive melody certainly doesn’t help and while Roger’s heartwarming story is touching, the over-the-top, overly heavy handed political statement (which I happen to agree with) was like being hit over the head with a sledge hammer during such a sentimental song… didn’t work. Perfect Sense once again got the crowd on its feet, but the inflatable spaceman seemed like a dopey toy-of-a-prop that was more embarrassing than anything. Kudos for Roger for playing yet another track from the usually overlooked, brilliant Animals album. But again, vocal assistance came into play yet again, and the little propaganda-graffitied Pig seemed like a cheap gimmic rather than a “WOW” concert prop. Even so, the song was a powerful way to end the 1st set. The 2nd set was all DSOTM and seemed a bit uninspired. The visuals were a bit bland and were formatted in the classic circular screen format. Roger stayed out of the spotlight for the most part, only taking the vocals during Time, which he adequately delivered. For an album that was being performed almost literally note for note, Broad’s improvised opening on the Tom Toms was pretty lame and a far cry from the brilliance of Mason’s original. Carol Kenyan’s Great Gig in the Sky was excellent. The only time I’ve ever seen a better performance was during the last tour of The Australian Pink Floyd show… hands down the best vocal ever. Money and Us & Them were just okay, but Any Colour You Like was a brilliant jam. This is where the 2nd set really came to life for me and the closing tracks, with Roger doing the vocals was terrific. The Happiest Days and Another Brick 2 started off the encores and were certainly a crowd pleaser. Vera and Bring the Boys Back home followed and were certainly welcomed new additions to the set list (even though Boys used vocal assistance once again). Comfortably Numb closed the show, and while it was nice to hear Roger singing his part, the guitar solos really missed Gilmour’s soul and passion. Pink” once and for all, for me anyway. Finally, the crowd seemed to LOVE this show and was enthusiastically supportive throughout. This seemed to genuinely touch Roger as he has certainly run into some resistant audiences along the US leg so far. Despite knowing in advance every song that Roger was to play last night in Chicago, I still came away feeling that I got more from the show and performance than I was hoping and/or expecting to. I feel lucky to have seen this band with a good many dates already under their belts – because this band is ON. I was impressed. It was my second time seeing Roger (last was in 1999). And as good as that show was in ’99 – this was altogether different (and IMO, better). The genius dramatist at work. In any case, I enjoyed the musicality and the conceptual arrangements of Roger’s show immensely. He exceeded my expectations. This was a Roger Waters production of the most modern variety. The backdrop screen was astonishing. I’ve never seen anything quite like it. Truly mesmerizing. And the band! Sorry Gilmourians, I am with you guys, but you gotta hand it to that Kilminster guy. He can play – and makes no apologies for going out there and trying to recreate nearly exactly what David Gilmour would do. He has the gear, the tone, some of the attack, the ear…it was frighteningly impressive. Only on rare occasion did he fall short of what the songs were begging for. This sounded quite a bit like “Pink Floyd.” No Echoes of course…but did hear Sheep. No Fat Old Sun or Wots Uh The Deal…but we did hear Mother and Set The Controls for the Heart of the Sun. It’s amazing in and of itself that one band could fragment in two directions, yet still hold such potency on either given side of the fracture. Anyway, back to the show (we’ll leave the dream for the dreaming). 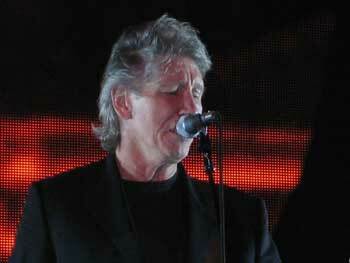 Parting thoughts on the show: Roger’s version of Wish You Were Here is quite possibly my favorite at the moment. Stunning, beautiful, heartfelt and somehow new. I love it. Roger’s vocal was pure. Oh yeah, is he lip-syncing? Probably…in places. Who cares. It’s not as if they are all dancing to the records. It’s a live performance – take it or leave it. FIRST HALF: In The Flesh, Mother, Set The Controls For the Heart Of The Sun, Shine On You Crazy Diamond, Have A Cigar, Wish You Were Here, Southampton Dock, The Fletcher Memorial Home, Perfect Sense parts 1 and 2, Leaving Beirut, Sheep. SECOND HALF: Dark Side of the Moon. ENCORE: The Happiest Days Of Our Lives, Another Brick In The Wall (Pt 2), Vera, Bring the Boys back Home, Comfortably Numb.